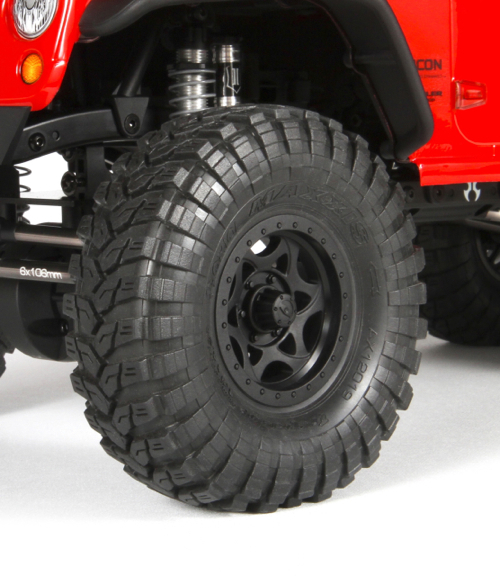 Most steps in building an RC kit such as the Axial Jeep Wrangler Unlimited Rubicon are pretty straightforward. If you follow the instructions and use the correct parts, most building steps are fairly hard to get wrong. A few other steps seem simply, but are, in contrast, pretty easy to get wrong if you aren’t familiar with how to properly do the task. Gluing tires is one such step. No need to worry. Follow these tips and you’ll get your tires glued up perfectly. As part of the manufacturing process, molded parts are coated with a mold release agent that is used to facilitate the removal of the part from the mold. The mold release can inhibit the ability of the glue to do its job. 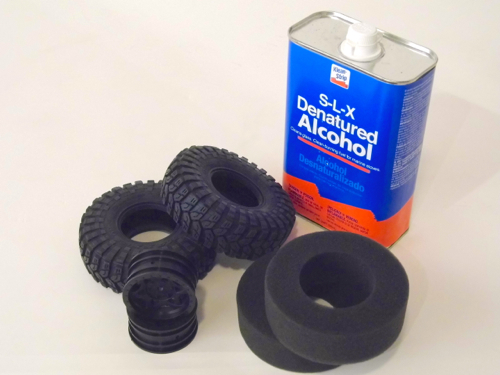 The easy solution is to quickly clean the bead areas of the tires and wheels before gluing. Remove the foam inserts from the tires before cleaning. Do not use ordinary household cleaners such as window cleaner as the chemicals in the cleaner may also prevent the glue from properly adhering. Denatured alcohol and rubbing alcohol work best, but RC motor spray (make sure it’s plastic safe) can also work well. Follow all safety precautions on the label of the cleaning product you choose. Saturating a paper towel with cleaner and rubbing the bead area of the parts until no residue shows on the paper towel is all that is needed. You may have to use a clean area of the towel frequently and reapply cleaner. When the parts are clean, let them dry before gluing. Quickly check the bead areas of the tires for any extra material, called flashing. 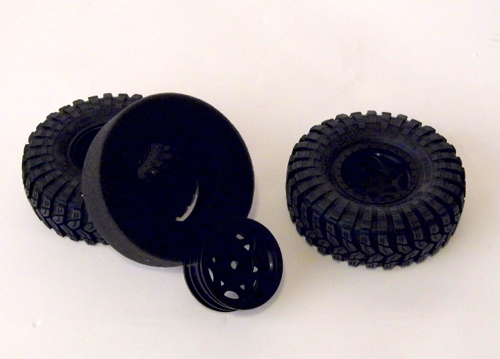 Axial Racing tires are high quality and precision molded, but it is still good to check. Remove any extra material with scissors. Next, reinstall the foams and make sure the foams are perfectly centered in the tires. Slide each tire over a wheel and make sure the tire is seated down completely on the wheel and that there are no gaps or bulges. The tighter the tire is held to the wheel, the stronger the bond will be. The end result will also look better and perform better. Place two large wide rubber bands over each tire—one on each side firmly holding the tire to the wheel. 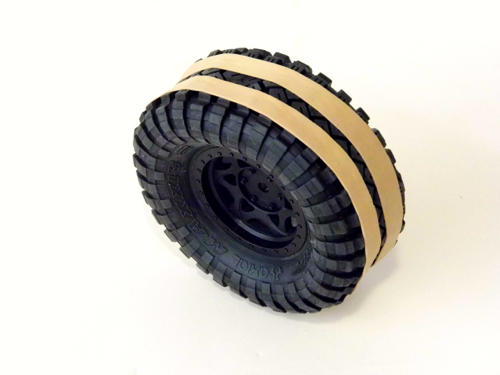 The rubber band trick will work on smaller 1.9-inch tires as found on the Axial SCX10 to larger 2.2-inch tires found on the Axial Wraith. 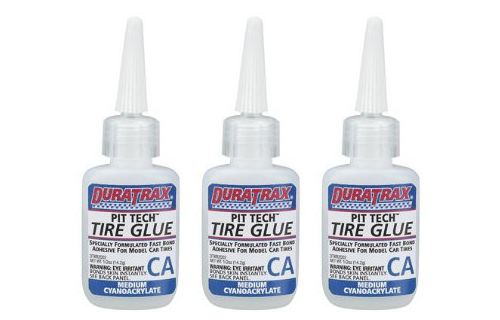 Use only hobby specific CA glue when gluing RC tires such as Duratrax Pit Tech Tire Glue. Medium viscosity glue is the easiest to work with. In contrast, thin CA glue is too likely to run and it’s too easy to over apply. The thick CA takes too long to set. The key to a good glue job—one that looks good and is strong—is taking your time. Pull back the tire just enough to add a single small drop of glue. Start in the 12 o’clock position and move to the 6 o’clock position. Do this on one side of one tire and wheel combo and then move on to another tire and wheel. Do all of your tire and wheels—just one side. Let the glue dry for a few minutes and then check the 3 o’clock and 9 o’clock positions of each tire. Add a single small drop as needed. Let the tires dry completely and then do the other side in the same manner. Keep in mind the two biggest mistakes made are using too much glue and going too fast. After all of the tires are glued, check for any loose spots and after adding small drops of CA glue as needed, let them dry completely before using. We all make mistakes. If you have a gluing mishap such as a runaway drop of glue dripping down the side of the tire, it can be fixed if you act quickly. Find a lint free rag and soak a small section in rubbing alcohol or denatured alcohol. If a drop of glue runs, you can quickly swipe it with your rag and minimize the unsightly mark it leaves on the outside of the tire. It is a very good idea to test the rag you’ve selected on a piece of scrap material with glue on it. This will make sure the rag doesn’t leave behind a residue.